The What: Ricoh has launched a new cognitive-enabled interactive whiteboard that uses IBM’s Watson intelligence and voice technologies to actively support people in meetings by responding to commands, taking notes, actions, and even translating into other languages. The What Else: The Intelligent Workplace Solution leverages IBM Watson IoT and Ricoh’s interactive whiteboards to change the way teams meet and collaborate through new intuitive features that can be accessed using natural voice. It makes sure that Watson doesn’t just listen, but is an active meeting participant, using real-time analytics to help guide discussions so teams can make faster, better, and more informed decisions. Most companies find that the majority of information shared and discussed during meetings may be lost or forgotten. Ricoh is incorporating this new solution into its broader set of service offerings to help customers continually improve meeting collaboration and productivity. Likewise, IBM sees a range of more complex smart meeting support functions in the future, thanks to Watson’s learning capabilities. The Bottom Line: The new solution is designed around simple, global voice control of meetings: once a meeting begins, any employee, whether in-person or located remotely in another country, can control what’s on the screen, including advancing slides, all through simple voice commands using Watson’s Natural Language API. The Intelligent Workplace Solution can translate speakers’ words into several other languages and display them on screen or in transcript. With the swipe of a badge the Intelligent Workplace Solution can log attendance and track key agenda items to ensure all key topics are discussed, and during a meeting, team members can also hold side conversations that are displayed on the same whiteboard. 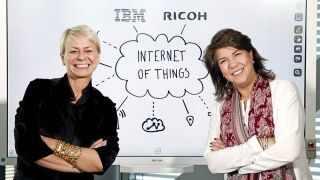 IBM is installing more than 80 Ricoh interactive whiteboards in its new global Watson IoT headquarters in Munich, Germany.